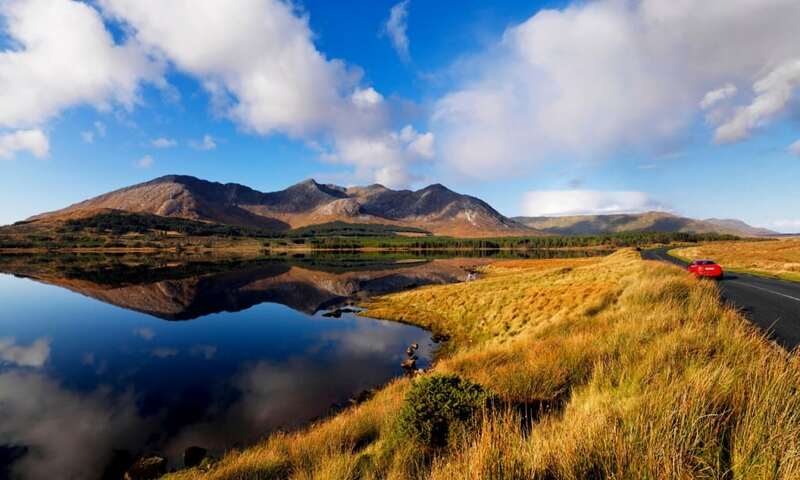 The Connemara Cycle Route is a moderate 1 to 3 day (150km or 100 miles) looped scenic cycling trail through the wilds of Connemara visiting the one picturesque village after another, stunning beaches and inspiring Wild Atlantic Way coastlines in Co. Galway on the west coast of Ireland. Starting from Clifden, the Connemara Cycling Route is a looped trail encompassing the best attractions, things to see and do and picture perfect villages Ballyconneely, Roundstone, Kilkieran, Leenaun and Letterfrack. There are also a number of Wild atlantic Way discovery points along the route including The Sky Road, Derrigimlagh Bog, Bunowen Bay, Gorteen Bay, Finish Island (Oileán Fínis), An Gort Mór hill, Killary Harbour and Fjord, Crump Island view, ferry to Inishbofin and Omey Island. The Connemara 150km cycle route follows mainly minor country roads and combination of smaller loops allows a number of options of varying length, difficulty and areas of interest. The trail travels through unspoilt and spectacular terrain that is dotted with beaches, islands, scenic viewing spots, lakes, coastlines, cliffs, beaches, mountains, hills, caves and rivers. There are many top attractions to mention along the route including Kylemore Abbey, so be sure to stop and savour whats on offer and plan your route to visit the ones that interest you.